To understand just how much how Farmer-to-Farmer helps young entrepreneurs, meet Nepal’s Binod Chaulagain, who lost his father when he was just 12 years old. His family was uneducated, so he began to think about ways he could help them. He came up with a small livestock and forage production business — but quickly realized he needed more training. That’s when he joined Youth Partnership for Development Peace Nepal (YSP-Nepal), a nonprofit organization in the Ramechhap district that mobilizes young people to develop skills in agriculture, livestock and entrepreneurship development. YSP-Nepal gave Binod self-reliance training; it also helped him see the advantage of starting a nursery, because it had more profit potential than other activities. 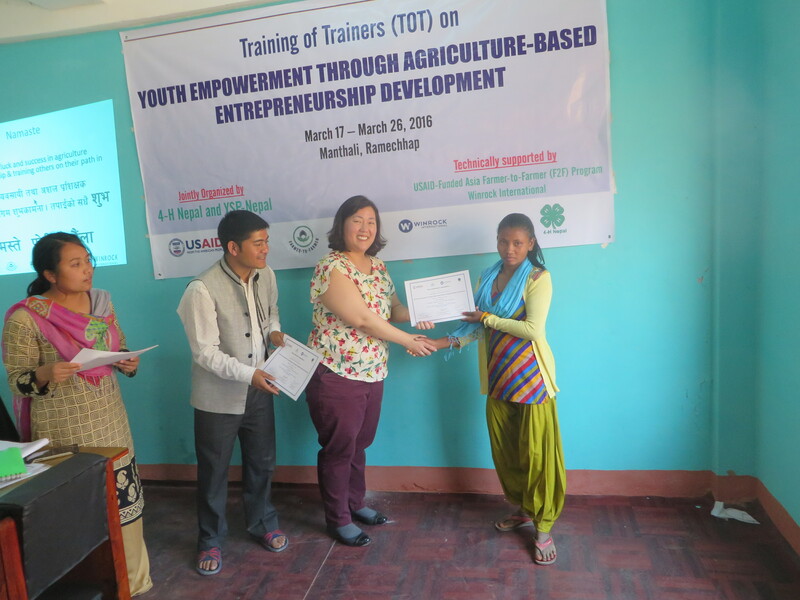 Farmer-to-Farmer volunteer Dr. Tiffany Drape at a training with members of YSP-Nepal and 4H Nepal in 2016. Through the interactive training, Binod and 37 other young participants increased their knowledge and skills in business planning, SMART goals development, financial planning and marketing. Based on Drape’s business management recommendations, Binod has since invested some of the profits from his nursery business — a smart move that enabled him to double his land from 750 to 1,500 square meters and expand his business to include over 100 species of plants, including fruits, vegetables and herbs. This increased his potential crop output from 300,000 Nepali rupees (about $2,900) to one million Nepali Rupees (almost $9,700) within one year. Encouraged by his success and eager to put his new skills to use, Binod provided an intensive training to 15 young people in various aspects of business management and marketing techniques based on the training he received from Drape. In addition to his nursery enterprise, in the past year he has begun to provide agriculture and business management training as a consultant, working in various districts to train other farmers (including 75 youth) to establish livestock and forage farms. From this new enterprise, he has added 42,000 Nepali rupees (more than $400) to his income. Drape distributes completion certificates after her training.